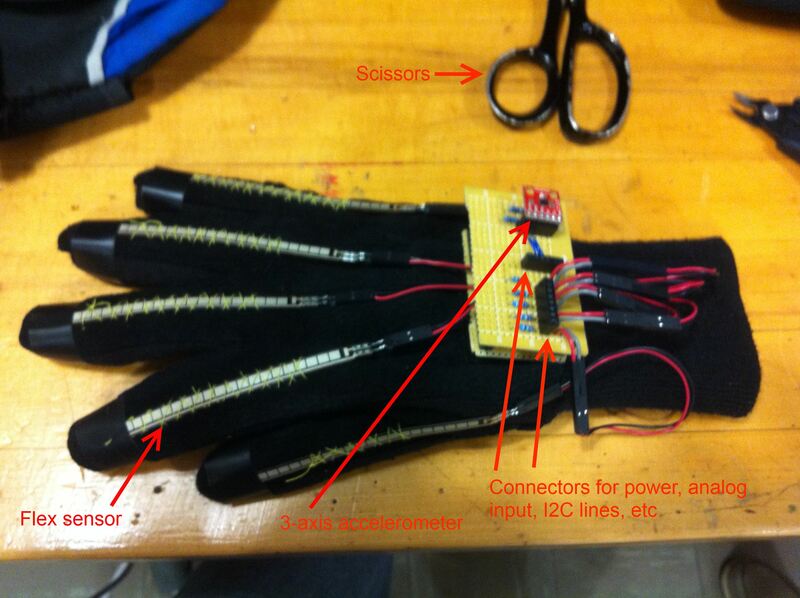 This is the glove that we are using to track the fingers and rotation of the hand about an axis parallel to your forearm. Flex sensors detect the degree of bend in each finger. As a finger bends, their resistances change, and this can be detected by an ADC, which is then mapped onto a servo rotation angle. The IC on the back of the hand is a 3-axis accelerometer. Depending on the orientation of the hand, the force of gravity registers different forces on the X and Z axis, which can then be used to retrieve the angle that the wrist is tilted by. That’s as fancy as the glove gets, and for now everything connects to the rig through a long cable, but it would be nice to make this wireless in a future revision.